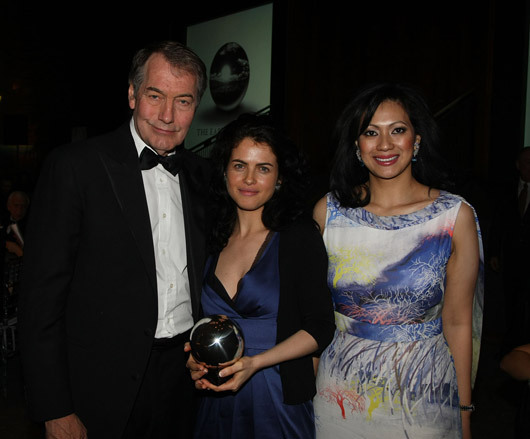 Last night, MIT presidential research fellow Neri Oxman was named the winner of the first annual The Earth Awards. Presented the award by TED Prize winner Cameron Sinclair and Datin Azrene Abdullah, Oxman was recognized for her groundbreaking project FAB.REcology, which combines the principals of biomimicking with the design and construction of built environments. As master of ceremonies, Charlie Rose, made his rounds in the famed pool room of Philip Johnson’s iconic Four Seasons Restaurant to briefly interview all ten finalists before the winner was named. The event united some of the world’s most influential environmentalists, architects, venture capitalists and media as a part of an elite Selection Committee who chose FAB.REcology as its winner. Selection Committee members present at the event included Paola Antonelli, Adam Bly, David Buckland, Antonio de la Rua, Scott Hahn, Peter Head, Graham Hill, Michael McDonough, Barry Malebuff, Sergio Palleroni, John Picard, Suzanne Trocme, Dilys Williams and Kenneth Yeang. Other guests of the event included Lady Liliana Cavendish, Jennifer Creel, Todd Eberle, Lonneke Engel, Lisa Marie Fernandez, Marjorie Gubelmann, Rogan Gregory, Valesca Guerrand Hermes, Maya Lin, Fern Mallis, Ghislaine Maxwell, Peter McGough, Dr. Woody Merrell, Elinor Milchan, Aimee Mullins, Richard Pandiscio, Dennis Paul Jr., Keith & Inga Rubenstein, Annabelle Selldorf, Andres Serrano, Ivan Shaw, Hunt Slonem, Ling Tan, Yeholee Tang, Zang Toi, Gucci Westman and Aaron Young. 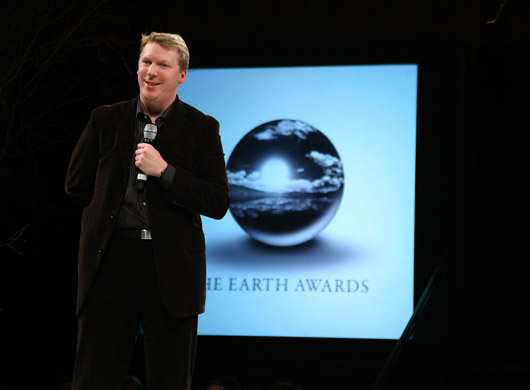 The Earth Awards conducted a global search for products and concepts that are sustainable, innovative and for many, essential to improving basic quality of life. Submissions were received from designers worldwide, in disciplines as varied as industrial design, architecture, fashion, agriculture and alternative energy. The awards specifically sought out nascent designers whose work is not commercially available, giving them an opportunity to have their ideas analyzed by leaders in the field of environmental design and policy. Though only one winner was named at The Earth Awards, all finalists will be introduced to industrialists and joint venture companies in the hopes of generating significant commercial opportunities for their work. Neri Oxman is an architect and researcher whose work attempts to establish new forms of experimental design. She is the founder of an interdisciplinary design initiative, MATERIALECOLOGY. A graduate of the AA School of Architecture, and previously a medical scholar at Hebrew University and the Technion Institute of Technology, she is currently based at the Massachusetts Institute of Technology, where she is a presidential research fellow and a PhD candidate in Design Computation. For her revolutionary work FAB.REcology, Oxman receives a significant cash prize from The Earth Awards, as well as a stunning trophy designed and handcast by Royal Selangor in Malaysia. In addition to FAB.REcology, finalists Engaged Offsets (Bill Browning, Christopher Pyke, Dana Bourland, Amy Davidsen & Benjamin Feldman), Iluma (Andrew Neal & Timothy Porter), and Open Blue Sea Farms (Brian O’Hanlon) were recognized with honorable mention. The top ten finalists also included 12 Climate Entrepreneurs (Jacob Rutqvist), Earth Markets (Bryan Garcia & Kerry O’Neill), Folded Bamboo + Paper Houses (Ming Tang, Dihua Yang), R3 (Tom Sieu & Mary Scott), ROSS (James Brown, Amanda Jones), and Warning Bulb (Young Duk Song, Yang Yoon Sun & Kim Ga Ye).